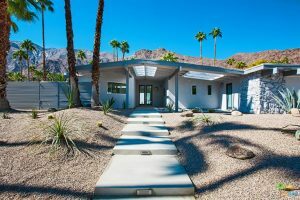 Twin Palms Homes for Sale – Palm Springs CA Real Estate: The desirable mid-century neighborhood of Twin Palms is located in Palm Springs directly south of Highway 111 and the famed Ocotillo Lodge (Alexander/Krisel/Palmer). Twin Palms is the first subdivision of Alexander constructed homes in the Coachella Valley – built between 1956 and 1957. This historic Palm Springs neighborhood features homes designed by renowned modernist architect William Krisel. Each home came standard with two palm trees, from which the name “Twin Palms” was coined. If you would like to set up a private showing or would like more information about any of the above Historic Tennis Club Palm Springs homes for sale, please give award-winning Palm Springs REALTOR® – Elaine Stewart a call. Elaine specializes in luxury real estate in Palm Springs and the surrounding area and would be delighted to answer any questions you may have. Call Elaine today! 760-668-2399. Twin Palms is a neighborhood where homebuyers can find the best mid-century moderns in all of Palm Springs. These highly sought-after Alexander/Krisel homes provide buyers with iconic mid-century desert ranch homes and one level bungalows. Twin Palms homes for sale designed by Krisel feature a single floor plan with varying facades, plan rotations, and rooflines on approximately 10,000 sq.ft. lots. The angular home designs offer plenty of open space and feature open beam ceilings and signature roof styles such as the butterfly roof, low-gabled roof, and folded plate roof. Most of the Twin Palms homes for sale have been lovingly restored back to their original grandeur and have been updated with modern conveniences in keeping with their original design. Embodying the classic Palm Springs lifestyle, homes come with private swimming pools, majestic mountain vistas, and dramatic mid-century architecture. Buyers who are interested in condos in Twin Palms can enjoy low-maintenance living in the south end of the community. Twin Palms real estate, including condo residences, is priced from $230,000 to just under $1 million. Twin Palms is ideally located near every convenience in the city and within minutes from downtown Palm Springs. Fine dining, specialty cafes, art galleries, unique boutiques and exciting nightlife are all just a short drive away. Local points of interest within close proximity to Twin Palms homes for sale include the Spa Resort Casino, the Palm Springs Art Museum, the Palm Springs Convention Center, the Palm Springs Air Museum, the Palm Springs Ariel Tramway/San Jacinto Mountains, and Palm & Tahquitz Canyon hiking. The Palm Springs International Airport is about a 6-minute drive from the Twin Palms neighborhood. With over 24 years of real estate experience, Elaine Stewart offers a wealth of local market knowledge and expertise. As a licensed, professional Palm Springs REALTOR®, Elaine is committed to providing her clients with accurate, reliable and trustworthy information and the personalized service they deserve. Elaine truly enjoys helping her clients with the process of buying or selling a home in the Coachella Valley. She is an expert at uncovering the right homes in the right neighborhoods that are the best match for your individual requirements. Elaine would be delighted to speak with you about Twin Palms real estate and help you decide if this desirable and historic neighborhood is the ideal fit for you. Please give award-winning REALTOR® – Elaine Stewart a call today at 760-668-2399 or fill out the online contact form and she will be happy to answer any questions you may have.